Kogod’s Educational Enhancement Fund (EEF) is all about the experience. The Fund, established in Summer 2017, allows students to pursue their passions outside of the classroom—whether they’re competing in a competition, networking or attending a conference. “We want to give students a chance to explore their interests and their professional goals,” says Andrew Toczydlowski, Director of Student Development and Services. The EEF was founded as a monetary resource for professional development for Kogod undergraduate and graduate students. Individuals apply online with a pitch of how their chosen opportunity will enrich their education; chosen applicants work with staff, faculty and centers across campus to prepare. Toczydlowski says this interdisciplinary design is one of the Fund’s distinguishing qualities. The Kogod Center for Career Development (KCCD) and the Kogod Center for Business Communications (KCBC) are participating entities, exposing students to different staff and faculty perspectives. 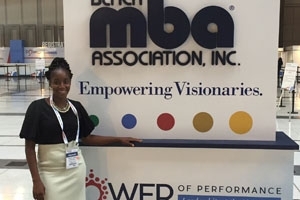 Most recently, the Fund sponsored a group of MBA students to attend the National Black MBA Association’s (NBMBAA) conference and exposition in Philadelphia, PA. The annual event, held this year on September 26-30, featured an array of top-executive speakers; educational sessions centered on business topics like leadership and financial prosperity; and a career expo with employers from across the nation. The event also gave her the opportunity to network with employers she wouldn’t have met otherwise—a primary goal of the Fund. Company representatives from LinkedIn, Coca-Cola, Marriott International, and BMW, among many others, were present and available to meet with conference attendees. MBA student Zoe Bludevich was also on the trip. She says networking was the highlight of her experience. “This experience gave me the opportunity to meet with over 300 employers. I was able to make meaningful connections and gain a ton of career leads,” she says. Other EEF-sponsored professional development opportunities include the US Chamber of Commerce Foundation’s case competition for MBA students, as well as the CUIBE (Consortium of Undergraduate International Business Education) in Boston, MA, for undergraduates. EEF applications are accepted on a rolling basis, leaving the door open for other opportunities as they arise. While the Fund doesn’t pay for each event in its entirety, many students’ jobs do. Toczydlowski has found that when students approach employers about partially EEF-sponsored events they’re willing to cover remaining expenses. A majority of students end up paying little to nothing out-of-pocket. “Students have really been able to leverage other resources as a result of the Fund,” Toczydlowski says. And perhaps that’s its greatest benefit of all. Learn more about the Educational Enhancement Fund today.